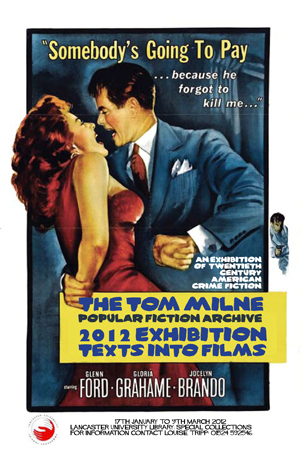 Crime Films, 1940 – 2000: A Free Film Festival Between Friday 20th and Friday 27th January, the Exhibition will be accompanied by a free film festival, open to all members of Lancaster University. It will show of a mixture of classic film noir and post-1960s neo-noir every evening in the Elizabeth Livingstone Lecture Theatre. The festival will include films based on Dashiell Hammett’s Maltese Falcon (d. John Huston, 1941), Raymond Chandler’s Farewell My Lovely (Murder, My Sweet, d. Edward Dmytryk, 1944), James M. Cain’s Double Indemnity (d. Billy Wilder, 1944; paired with Lawrence Kasdan’s 1981 take on Cain’s plot, Body Heat), John D. MacDonald’s The Executioners (Cape Fear, d. J. Lee Thompson, 1962), Donald Westlake’s The Hunter (Point Blank, d. John Boorman, 1967), David Goodis’s Down There (Shoot the Piano Player, d. Francois Truffaut, 1960), Patricia Highsmith’s Strangers on a Train (d. Alfred Hitchcock, 1951), Elmore Leonard’s Rum Punch (Jackie Brown, d. Quentin Tarantino, 1997), William P. McGivern’s The Big Heat (d. Fritz Lang, 1953), and Jim Thompson’s The Grifters (d. Stephen Frears, 1990). Maltese Falcon was serialized in five parts in Black Mask in 1929-30 before being published in book form in 1930 by Knopf. Three films were based on it, produced in 1931, 1936 (Satan Met a Lady) and, best-known, the John Huston-directed Humphrey Bogart film of 1941.